ChainLink Research : Research :Retailer Collaboration: Myth or Reality? Retailer Collaboration: Myth or Reality? The theme of the recent RVCF conference was Collaboration. The move to getting better performance from suppliers and retailers ultimately depends on it. Read on for real results. A few years back we did some research on the Collaboration Journey and asked suppliers and retailers what the direction and their next steps would be on their collaborative journey. Figure 1 shows the direction most organizations were taking. However, most relationships have not gotten beyond forecasting. Nonetheless there were many accomplishments such as collaborating on promotions, carrier consolidations, sharing channels/ecommerce, and some category management (most rare). 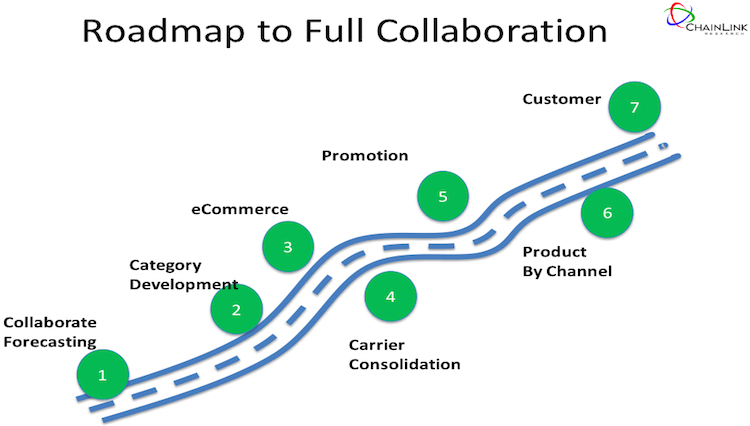 It is interesting to note that when I presented this at a previous RVCF conference, many suppliers were confused about what eCommerce collaboration was. Wasn’t that just selling to retailers? But today with the “Amazon dealer model” well in place with many commerce sites, as well as the Sears service and logistics model taking off, this type of approach has clearly gotten traction. In the last two weeks at the conferences I have attended, the collaboration topic has come back in force in two compelling examples. This conference had several speakers who talked about collaboration. Stephany Goodnight, Vice President, Replenishment, Customer Satisfaction, AutoZone and Eric Aronowitz, Retail Solutions and Offer Manager of BP Lubricants, co-presented one of the best examples I have ever seen on how good it can get. They started with the goal in mind. As they told us, “We wanted to be great collaborators.” This did present some challenges, since not everyone in their respective companies was initially supportive. Although in the end, the results proved so rewarding that it appears the skeptics, including store operations, saw the value. Their goal, ultimately, said Aronowitz, was creating an “integrated value chain,” spanning most of the touch points between the retailer and the supplier. Thus, planning and forecasting, promotion management, outbound/inbound distribution, and so on are included in this kind of model. AutoZone focused on their biggest selling items and BP on their biggest customers. This made the project more difficult, since there were more people who had to get involved, but the ultimate rewards were much higher. Not only were the processes changed, but significantly richer and timelier information allowed them to become more responsive, resulting in uplift in day-to-day sales and promotions. Interesting new displays, new custom pallets, and different space allocation in the warehouses also resulted in improved distribution, but more importantly, sales. Goodnight also talked about the minutiae of data required. Demand is a local thing as most retailers will attest, so local and regional needs had to be met. This included recognition of existing store inventory before they overlaid them with more inventory in anticipation of a promotion. Most retailers stock up in advance, but BP and AutoZone developed a more rapid replenishment process. It was a challenge to convince the cross-functional teams that this would work. In the end, they not only increased sales, they also increased turns while avoiding stock-out at the stores. This faster planning cycle also reduced change orders and scrap at BP. Now they were more focused on actual demand. What’s required here is a commitment, Goodnight told us, since the vision at the outset might not be what you ultimately wind up with. Working with a partner requires a lot of listening. Now they have created a culture of change in which employees are asking what more can be done to create improvements. Just the kind of culture required to continue to improve performance. As challenging as this is, ultimately, only two parties—the retailer and supplier—have to agree on the direction. I led a session on RFID and the value for both Retailers and Suppliers. 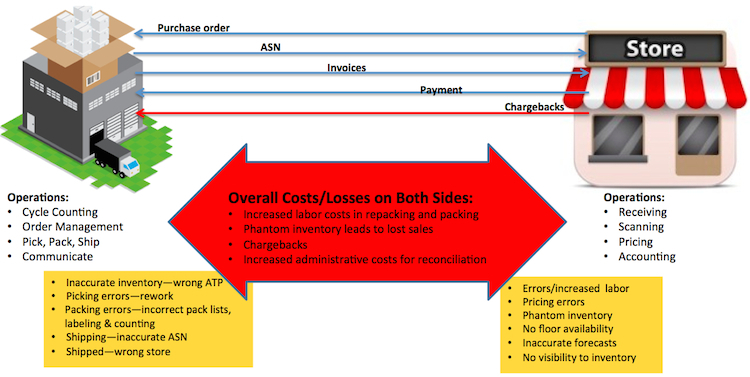 Today the supply chain still is plagued by errors and the subsequent costs associated with them (Figure 2). As more retailers implement RFID, suppliers should think beyond compliance and think about what RFID can do for them and the relationship between them and their customers—the retailers. Many retailers told us that they were confident that the improvements RFID would bring to the suppliers’ processes would result in value that would reflect back to the supplier from the retailer. For example, more accurate shipments would mean faster payments and no charge-backs. And better inventory visibility can mean higher velocity inventory turns and resulting sales. Thus if RFID is an element of a retailer’s supply chain, suppliers should engage in discussions with the retailer about how they can mutually benefit from this initiative. Upping the ante in collaboration is carrier consolidation. This is an area I have heard big retailers discuss over the years as a way to save time and money in inbound, mostly by reducing receiving headaches. FoodLink Online talked about ways small growers (or any kind of suppliers, really) can save cost and effort though carrier consolidation. The last two years have seen an energetic revival of interest in collaborative programs. With enabling technologies such as the cloud, mobile, RFID and better planning systems, the real challenge today in successful collaboration is commitment from organizations. As in any change program, people make it so.